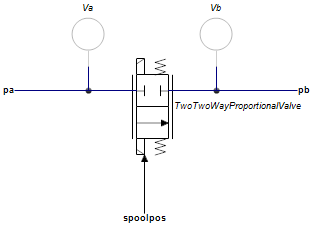 This model describes a 2/2-way proportional control valve with second order spool dynamics and parasitic volumes. The flow through the valve is described as laminar/turbulent flow through an orifice. A detailed description of the valve can be found in TwoTwoWayProportionalValve.htm.